All Lift Chairs adds two new Lift Chairs! December 8th, 2011 – Raleigh, NC - All Lift Chairs, an online retailer of lift chairs and home mobility lifts for the disabled and elderly, is proud to announce their two newest product offerings. Starting now All Lift Chairs will now be carrying two new lift chairs from Golden Technologies, the Golden Capri and the Golden PR-355L. Both the Golden Capri and the Golden PR-335L are lift chairs designed for more cost efficient customers, priced at a reasonable $609.99 and $709.99, respectfully. 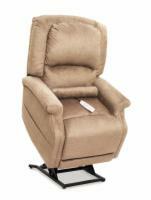 All Lift Chairs is an online retailer of lift chairs and home mobility lifts for the elderly and disabled. Their product line includes lift lift chairs, walk in tubs, bath lifts, and much more. For more information please visit www.all-lift-chairs.com.